Back fat is not easy to deal with and looks awkward when you wear a strapless dress. Excess flab on your back or any other part of your body can make you look awful along with reducing your self-esteem. Dealing with the fat on the front of your body is easy, but reducing your back bulge could be a bit difficult. Well, it’s not an impossible task to get rid of back fat, and you can get a slim-trim figure with the help of the following workouts. This exercise will help the upper back, quads and glutens. Place your feet next to each other and stand straight. Now join both your hands (palms facing each other). Now inhale slowly as you bend your legs from the knees so that you bring your hips down. Bring your arms above your head, assuming the fierce pose. Slowly exhale and bring the right elbow over to the outer side of your left knee. Push the bottom elbow towards your thigh. As you do this, lift your chest up and rotate outwards to increase the twist at your waist. Stay in this position until you count five breaths. Breathe in as you slowly go back into the fierce position. Repeat on the other thigh. This back fat exercise will work on your back as well as shoulders. Stand with your feet together (make sure you have enough space round you when you perform this exercise). Now move all your weight onto the left leg. Slowly lift the right leg backward so that your body is parallel to the ground. Spread out your hands – as shown in the picture above. Push your navel to your spine. Hold this position for four-five breaths. This will work on the sides of your torso as well as your back. Assume the downward facing dog position as shown in the picture below. Move your right foot and place it between your hands. Now slowly move up to form the Warrior 1 position. Now move to the warrior 2 position by opening up your chest, arms and hips. Now put your left hand on your left hip and extend the right hand outwards. Next shift your weight onto the right foot. Slowly lift up the left foot, make sure it remains straight as you lift it up. Place the palm of your right hand face down on the ground, just beneath the shoulder. In case, you are unable to touch the ground you can place it on a block or bend your right knee. Apportion your weight equally on your right foot and hand. Bring the left arm up while looking at the ground. Then slowly look up at your left hand. Hold this position for 5 breaths. Repeat the same on the left side. This is a very simple yoga asana that works on the core, legs and upper body, hence, an ideal exercise for back fat. Begin with the Down Dog position. Now bring your right leg forward and change to Warrior 1 position. Keep your right leg straight and stretch out your right arm. Now lower the right arm so that it touches the ground. You can use a block if you are unable to do so. Transfer your weight equally onto your heels. Raise your left arm so that it is parallel to the ground. Draw navel to the spine. 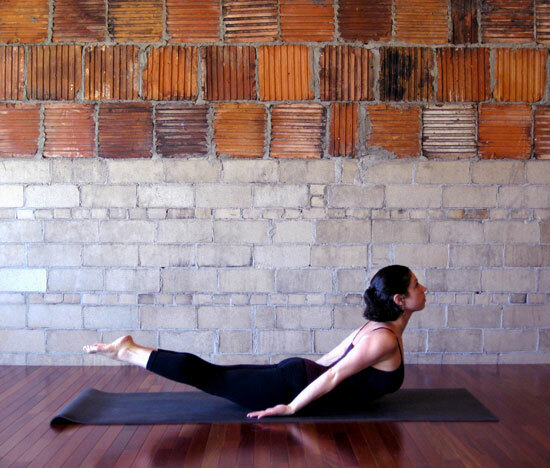 Hold the straight arm triangle pose for five breaths and then do the same on the left side. This exercise works on almost all parts of the upper body such as arms, abs, back and also the sides of torso. Start off with Downward Facing Dog pose. Place both the feet together so that the toes are touching. Shift the right hand towards the left in such a way that it is in the top middle of the mat. Roll to your right and place the right heel downwards as shown in the above image. Balance your body on the outer edge of the right flexed foot. Extend the left hand above your ear. Count five breaths and then return to the original position. Practice the same on the left side. This is an excellent workout for the shoulders, arms, back and abs. Begin with the Down Dog pose. Go down onto your forearms and stretch your feet backward. Make sure your hands are bent at the elbows and your shoulders are directly above them. How to lose back fat with this pose? Well, you just need to follow the below-given steps. Bend your knees inwards and hold the ankles using your hands. Inhale as you lift your thighs and feet up. Shift the weight of your body in the forward direction so that instead of resting on your pubic bone, you rest on your navel. Hold for five breaths and repeat again. Along with reducing the back fat, this pose also hones the muscles of legs and arms. Lie down on the belly and make sure your legs touch each other. Put your hands on the sides with palms up. Breathe in and lift your head, upper body and legs. Remain in this position for five breaths. Relax and repeat again. This is an excellent pose for burning the fat of your upper body and back. Bend your knees with feet flat on the mat. Now bend the elbows and put the palms down on the mat, beside your head. Your forearms should be perpendicular to the floor and fingers should face the direction of your toes. Breathe out and push your tailbone in the upward direction towards the pubis. Firm your buttocks and lift them off the floor. Ensure that your inner feet and thighs are parallel. Hold this pose for 2-3 breaths. This workout strengthens the overall body and also helps reduce the back fat. Stand under a pull-up bar. Hold the bar using both your hands, but make sure the palms are towards you. The chin will be above the bar. Now go down slowly so that your arms fully extend. Begin by standing with your feet apart. Bend your knees and lean forward with your upper body. Make sure to keep your back straight. Grab the barbell with both your hands and lift it up till your waist. Put is back down gently and repeat again for five breaths. Many people think that skipping only helps tone up the shoulders, but this is not necessarily true. It works on your back as well. This pose assists in getting rid of lower back fat. Lie down on your stomach with your arms stretched out in front of you. Now slowly lift your arms and chest off the ground by applying pressure on the shoulder blades. Lift the legs as well. Hold this position for five breaths, then relax and repeat again. For carrying out this workout, you will need a stability ball. Lie facing downward on the ball. Place your arms at the side of your body. Lean forward with your torso resting against the ball. Balance your body weight on your toes. Now lift your upper body as much as possible. Stay in this pose for a minute or so. Kneel on a stability ball with your stomach on the ball. Now roll out so that your hands can touch the ground. Your legs should be in the air. Next, bend your knees and make your heels touch each other, with the toes pointing outwards. Push your legs upwards as you lift the knees off the ball. Perform this for 1 minute. Lie on your stomach, your arms should be extended like a goal post and your legs should be stretched out. Now lift your right leg slightly off the floor and bend your knee at right angle. Hold for five breaths, and then return to the original position. For performing this exercise, you will need two dumbbells. Stand up with your feet apart at hip-width distance. Now slightly bend your knees. Your back should be parallel to the floor. Slowly lift a dumbbell in each hand. Remember to keep your knees bent and spine neutral (not rounded). Slowly lift the dumbbells further upwards, towards your torso. As you do this, bend your elbows and squeeze your shoulder blades. Your elbows should be pointing upwards. While doing this exercise you must pause at two points. First when you lift the dumbbells off the ground up to your knees. Secondly, when you lift them further upwards to your torso. Cardio workout is very important to stay healthy and it helps you lose weight as well. If you can’t go for running, invest in an indoor cycle. The more you cycle, the faster would be your heart beat and the more fat you will burn.